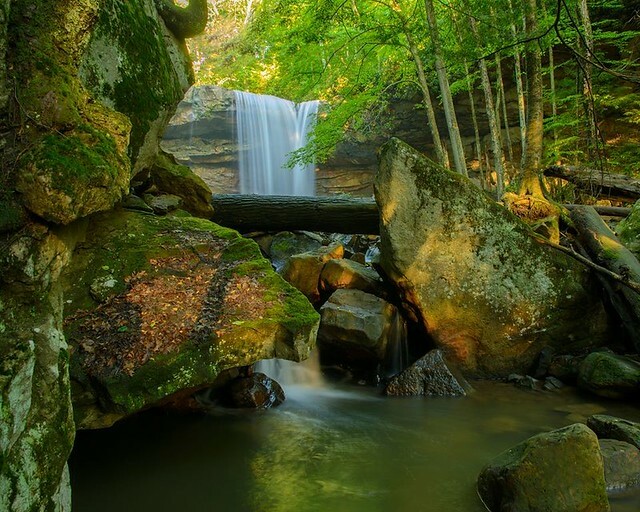 Located on the southern reaches of the Laurel Ridge, Ohiopyle State Park encompasses approximately 20,500 acres of rugged natural beauty and serves as the gateway to the Laurel Highlands. Close to major metropolitan areas and offering vast choices of activities, Ohiopyle State Park attracts millions of visitors annually. Turn left onto PA 31 east. Travel about two miles, turn right onto PA 711 and PA 381 south. Travel ten miles to Normalville, turn left onto PA 381 south. Drive for 11 miles to Ohiopyle. Take I-270 north to Frederick, MD. Take Rt. 40 and I-68 through Cumberland. Take Exit 14 (Keysers Ridge) to Rt. 40 west to Farmington, PA. Turn right onto PA 381 north for eight miles to Ohiopyle. Take I-79 north to I-68 east. Take Bruceton Mills Exit to Rt. 26 north. At the Pennsylvania border it becomes PA 281 north. Turn left onto PA 40 west, to Farmington. Turn right onto PA 381 north to Ohiopyle. SR 2019 is very steep. Large RVs should avoid this road. Take PA 40 to SR 2010 (Chalk Hill-Ohiopyle Rd). Follow it for eight miles to a stop sign. Go straight to the campground. For GPS Units: GPS coordinates for many locations are on the park map and in the text. For those who want to use an address, use 124 Main Street, Ohiopyle, PA 15470. This should direct you to the center of the park. Follow signage once you are in the park to find your desired destination. The Ohiopyle State Park Office -- Laurel Highlands Falls Area Visitor Center is an activity and information hub for the park and serves as a gateway to the larger Laurel Highlands region. Diverse exhibits throughout the building help visitors learn about wildlife and recreational opportunities in the park and region. A strong commitment to conservation and sustainable design is exhibited throughout the building, leading to long-term efficiency and responsible management. It was designed and constructed to United States Green Building Council (USGBC) Leadership in Energy and Environmental Design (LEED) guidelines for new construction. In 2015, the building was awarded USGBC LEED Gold Certification and a USGBC Forever Green Award. To find out more about the sustainability features incorporated throughout the center, explore the Going for Gold! Sustainable Building Design at Work fact sheet (PDF). View Ohiopyle Falls and stroll through the borough of Ohiopyle. Explore rare plants and fossils on Ferncliff Peninsula. See the deepest gorge in Pennsylvania from Baughman Rocks. Have a picnic with a view at Tharp Knob. Spend the night under the stars at Kentuck Campground. Start your backpacking trip on Laurel Highlands Hiking Trail. Bike the Great Allegheny Passage to a nearby trail town. Ride the sledding hill when the snow falls. View the falling waters at Cucumber Run. Sit in the creek bed and ride the water through two natural waterslides in Meadow Run. Caution must be used at all times as natural hazards exist. Parking is available adjacent to the SR 381 bridge crossing Meadow Run. Follow the signs to Meadow Run Trail or follow the path at the back of the parking lot. This activity or structure is ADA accessible. An ADA accessible observation deck is easily reached from the parking area. The park offers a wide variety of environmental education, recreational, and interpretive programs. Through hands-on activities, guided walks, and evening programs, participants gain appreciation, understanding, and develop a sense of stewardship toward natural and cultural resources. Programs focus on the Youghiogheny River, its gorge, and the natural, cultural, and recreational resources of the Ohiopyle area. Group programs must be arranged in advance and may be scheduled by calling the Ohiopyle State Park Office and Laurel Highlands Falls Area Visitor Center at 724-329-0986 .